Links to the tax documents for any account which earned at least $10.00 in dividends or any mortgage account on which you paid at least $600 in interest will be shown at the top of page. IRS form 5498 for your Pershing investment account (if applicable) will be shown here as well. 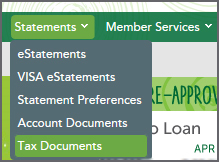 Clicking on the tax document link will bring you to detailed information on the account. For example, “Access your Form 1099 for your RCU share account” links to E-Statements. Your 1099 will be located on the Tax Statements tab. Why can't I find my 1099 online?